The annual Leonid meteor shower hit its regular peak over the weekend, but stargazers who missed the event may catch the second act of the shooting stars show tonight and early Tuesday (Nov. 20). November is the time of the Leonid meteor shower, when the meteors come swarming into our night sky view every as the Earth passes through a debris stream from an ancient comet. These ultra-swift light streaks appear to emanate from out of the constellation of Leo (hence the name, "Leonid"), a star pattern that currently rises in the northeast at 11 p.m. local time, and remains in view for the rest of the night. The traditional peak for the Leonids occurred before dawn on Saturday morning (Nov. 17). Many reports however, indicate that this year's display was unusually weak, with most people reporting no more than five to 10 meteors per hour. But that's not the end of the Leonids for this year. The year 2012 offers some of us another chance early Tuesday morning (Nov. 20) when the Earth passes through another Leonids debris stream. The Leonid meteor shower is created by debris from the comet Tempel-Tuttle, which orbits the sun every 33 years. During the closest approach to the sun, the star's heat causes some of the comet’s ice to crumble off, taking some dusty debris with it. Those lanes of debris are what Earth passes through each November to create the Leonids. The average Leonid visible to the naked eye is scarcely larger than a grain of sand. We know them best when they reach the Earth's upper atmosphere and flare into streaks of light from friction with the rarefied air. They enter the atmosphere at an immense velocity — 45 miles per second (72 kilometers per second), or 162,000 mph (261,000 kph) — and its kinetic energy is used up in such processes as the instantaneous production of light, heat and ionization. Thus, such a small particle can be seen as a “shooting star” from more than 100 miles away. Obviously, however, it's really the light energy that it develops and not the particle itself that we see. That interaction is expected to occur between about 12:30 a.m. and 3:00 a.m. EST, meaning that those living in eastern North America should have the best views. Maslov is forecasting 12:36 a.m. EST, while Vaubaillon says it will occur at 2:58 a.m. EST. Still, don’t expect a tremendous number of meteors. Maslov, in fact, thinks the display will likely not exceed 15 Leonids per hour as seen from a dark sky location (even less if you’re trying to watch from a brightly-lit city). Vaubaillon, meanwhile, concurs: "The density of particles doesn't look very high. Maybe a brief outburst at best." So why bother looking at all? In this case, it isn’t the quantity, but the quality of the meteors you may see. When a comet releases particles into space most are indeed the size of dust and sand grains, but there are also some larger pieces too, ranging from pebble size to perhaps a child’s marble. 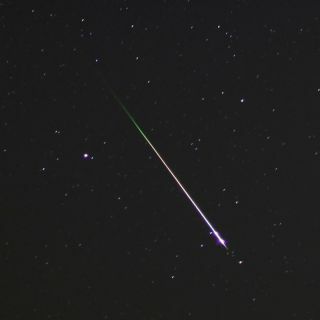 Those kinds of pieces can create outstandingly bright meteors, or "fireballs," perhaps even meteors that explode in their flight across the sky, known as "bolides." After a number of revolutions around the sun, most of the dust-sized particles become dispersed so only the larger pieces remain. Time is of no human consequence to these meteors. In the case of the clump of particles shed by Tempel-Tuttle in 1400, it has circled the sun 18 times. So if there’s anything left out there in space, there might at least be some of those larger pebble-sized pieces. The dazzling Leonid meteors are well-known for leaving particularly long-enduring incandescent sky trails, sometimes lingering for many seconds or even minutes. With binoculars you can see these trains drifting against the backdrop of stars, indicative of swift winds in the very high atmosphere. Over the central and western United States and Canada, the Leonids peak will occur due earlier in the night (on Monday evening), but viewing circumstances are less favorable. Along the West Coast for instance, the peak comes from 9:30 p.m. to midnight PST late Monday night. At best, perhaps a bright Earth-grazing meteor or two might be glimpsed. Earth-grazing meteors are space rocks that enter the Earth's atmosphere at a low angle, from the point of view of a given stargazer, and appear to scoot slowly and dramatically along the horizon. Astrophotographer Jason Hullinger took some photos of the Leonid meteor shower on November 17, 2012 in Joshua Tree National Park, CA. Or will Leonids Part 2 fizzle? Bill Cooke of NASA’s Meteoroid Environmental Office at the Marshall Space Flight Center in Alabama is also somewhat cautious. "In this case it is probably more where or when the particles were ejected than how fast. The small stuff from 1400 may be perturbed just right to intersect the Earth, though in past showers older Leonid trails have tended to have larger particles, such as in 1998," Cooke said. "My advice would be to look Tuesday morning — I will be." If you plan to follow Cooke’s advice, here are a couple of tips: Make sure to stay warm and get comfortable. Should you have a lawn chair that reclines, use it during your search for Leonid meteors since it will help keep your neck from getting stiff as well as make it easier to look at the night sky. Leonids will be streaking out of the northeast, but don’t stare at any one part of the sky; scan different areas – just keep looking all over. The Marshall Center is offering a live Ustream telescope view of the Leonids over Huntsville, Ala., from Nov. 16-20. So you can watch for Leonids on your computer screen if your local weather doesn't cooperate. Put simply, Leonids sightings may very well be very few and far between on Tuesday morning and perhaps they might not even show up at all. But even the small possibility of sighting a Leonid fireball is indeed tempting. Having witnessed a number of these over the years, I can assure you that seeing just one of those dazzlers will make your whole night. Hopefully, nature will be in a show-off mood in the predawn hours of Tuesday.